PT Adaro Energy Tbk - ADARO or referred to as "Adaro Group" is well-established public-listed company in Indonesia, running business in vertically integrated coal and energy industry. Together with its 32 subsidiary/affiliated companies, Adaro Group engaged in the field of integrated pit-to-power business model with three business pillars: coal mining, mining services and logistics, and power. Its business include mining assets, mining services, logistic, trading, electricity power, and land asset management. Based in Jakarta, Adaro Group has main locations in South Kalimantan. Adaro Group was formed in 2004 and officially listed at the Indonesia Stock Exchange (Stock Code: ADRO) on 16 July 2008. As of December 2016, PT Adaro Energy Tbk is 43.91% owned by PT Adaro Strategic Investments, 6.18% by Garibaldi Thohir, 14.68% by other key shareholders and 35.32% by Public. Adaro Group's business results in 2016 showed improved operational performance compared to 2015. According to PT Adaro Energy Tbk Annual Report 2016 as cited by JobsCDC.com, Adaro Group registered a 2.13% growth in total coal production of 52.6 Mt as compared with 51.5 Mt trillion in 2015. Total sales was recorded at 54.1 Mt up by 1.88% from 53.1 Mt in 2015. Candidate must possess education at least Bachelor Degree (S1) in Mining, Mechanical, Civil, Geological, Industrial and Electrical Engineering. Master Degree (S1) and fresh graduates are encourage to apply. Willing to be relocated at Tanjung South Kalimantan. JobsCDC.com now available on android device. Download now on Google Play here. Please be aware of recruitment fraud. The entire stage of this selection process is free of charge. 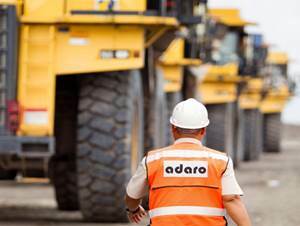 PT Adaro Energy Tbk - Recruitment Mining Professional Program ADARO Group August 2017 will never ask for fees or upfront payments for any purposes during the recruitment process such as transportation and accommodation.